Preschool activity tables come in a wide variety of shapes. You'll find that rectangle, trapezoid and round are the most versatile. These provide plenty of work space for art projects, reading lessons and group activities. You'll also find shape tables that serve unique purposes. Kidney and horseshoe shapes let teachers focus on each student. Clover and flower shapes let kids sit closer to the table and make it easier for shorter arms to reach papers and books. 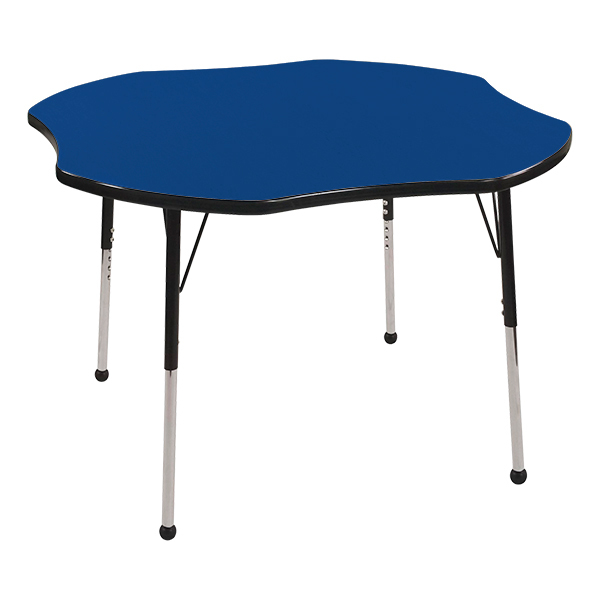 Adjustable Height tables are great in preschool classrooms since toddlers vary in size and grow quickly. For beginning learners, you'll probably need tables that range from 17 inches to 25 inches. Make sure to purchase tables that are easy to adjust – usually with screws at one inch increments. Fixed Height – If your tables will always be used for only one age group, a fixed height table will work well. Just remember to consider the seat height of your school chairs. Be sure to leave 8" between the seat and the tabletop. Particleboard tops range from 3/4 inches to 1 1/8 inches thick and have a laminate finish. This makes it easy to clean up after arts and crafts or snack time. Birch Plywood – For an even sturdier table, choose a birch plywood top with a laminate finish. Plastic – Polyethylene plastic or blow-molded plastic tables are a great choice for early learning classrooms, because they're extremely easy to clean and are waterproof. Tubular Steel – Particleboard tables generally have tubular steel legs. These are nearly always adjustable and have glides to keep the table in place. This ensures an even work surface for beginning writers and artists. Maple – All-wood tables have fixed-height maple legs. These are sturdy with no small parts or rough edges to scrape and poke. T-molding is a plastic strip (shaped like a "T") placed around tabletop edges. The long part of the "T" is glued securely into a groove. Thermofused Edgebanding uses heat to bond a plastic strip to table edges. It's more expensive, but it is nearly impossible to chip away and leaves no place for germs to hide. Preschool tables come in lots of great colors. You'll find neutral colors that will blend nicely with your existing furniture, or vibrant shades that kids will love. 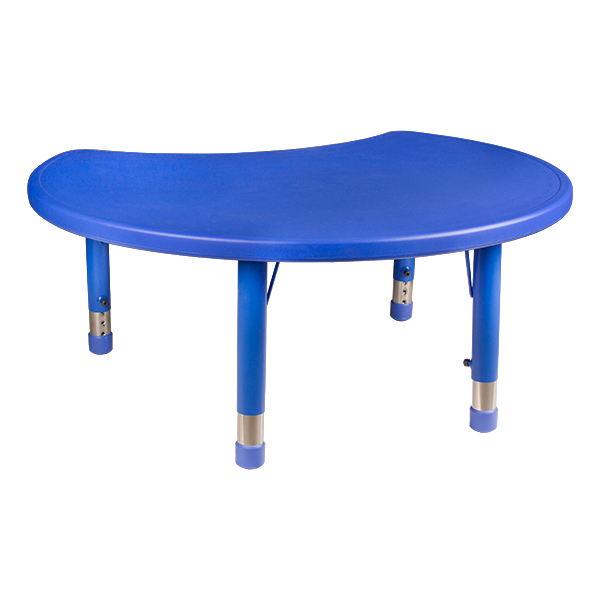 Shop our selection of preschool activity tables. If you're still not sure which table is best for your school or daycare, give us a call at 1-800-260-2776. Our friendly sales team knows all about preschool furniture and is happy to help.